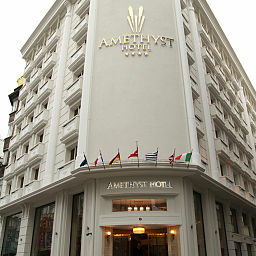 Located at the heart of historical peninsula and the shopping center of Istanbul, Amethyst Hotel provides top quality 4 stars hospitality with walking distance to Grand Bazaar, Hagia Sophia, Blue Mosque, Topkapi Palace and Basilica Cistern which are among the world’s most important historical and cultural places. Amethyst Hotel offers 6 suits and 84 standard rooms that are stylishly designed for comfort and elegance. Each room has LCD screen TV, internet connection, hair dryer, air-conditioning and minibar. Turkish and World cuisines serve with two restaurants which have capacities of 60 and 120 pax. Amethyst Hotel serves the unique tastes of Turkish and world cuisines with that special Turkish touch. You can also enjoy delicious cocktails in Lobby Bar whenever you desire. A fully relaxing area designed for their guests to let off steam and stress. Guests can enjoy a time to pamper and get away from the daily work and stress or just to relax after a long walk at the Amethyst Hotel SPA Center which has indoor swimming pool, Turkish Bath, sauna, massage rooms and vitamin bar. Guests can also enjoy fresh cocktails in Vitamin Bar to refresh themselves.